I just found out that Calvert DeForest, aka Larry "Bud" Melman, passed away on March 19. Here is one of my favorite Larry Melman moments from the Late Night with David Letterman show. One Final Thought on Star Wars . . . I could go on with Star Wars posts for a while, but I've decided to save some of those goodies for a later date and get back to the normal functions of my "World of Wonder". So I give you one final Star Wars post. Take a good look at the trading card above this text. I'm sure it is one that you all had at one time or another. 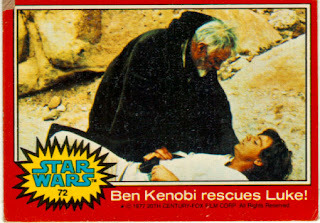 Did you ever notice that the guy on the ground is not Mark Hamill? It's his stand in. What gives it away is the hair color. Mark Hamill was a blond!!!! A great super 8 home movie reel featuring The Flintstones in "Steak Struck". Beautifully digitised by my good friend, Mark "Dangerboy" Nelson who added the delectable soundtrack (can anyone guess where the music is from originally?!) as well! Enjoy!